Nusa Dua Bali with fresh seawater and multifarious of tropical fish. At 09:00am You will be picked up from your hotel and transferred to Tanjung Benoa Beach Nusa Dua to Snorkeling experience. 10:00am - Arriving at the beach you will get the instructions by your local professional snorkeling guide about how to snorkel. Next, wearing the safety equipment which all those equipment will be provided and you will partake in to snorkel. 10:30am - Begin the Snorkeling You will have time to snorkel around 1 hour to see view of marine life and tropical fishes. 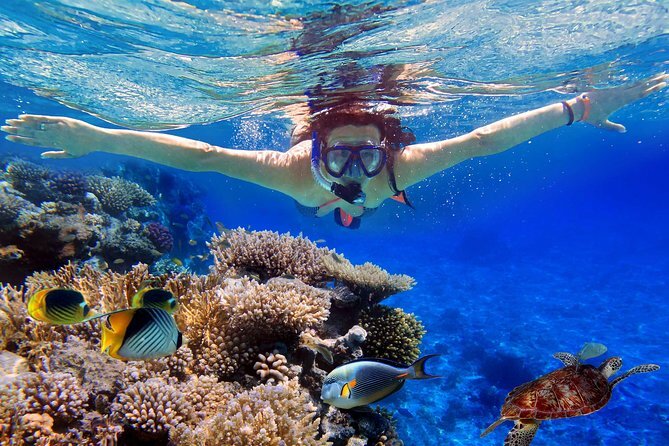 The snorkeling area has a sandy bottom and is home to one of Bali’s coral reefs. Here you will explore the reef, will be a chance to see cattle fish, angel fish, cow fish and moray eels. 12:30pm - End of Snorkeling and Lunch. After you finish your snorkeling, then you can take a shower and get changed before enjoying your lunch. Indonesian food for lunch will be provided near by the beach. 1:30pm - Return to your hotel. You will be transferred back to your accommodation to enjoying the rest of the day.